When you set up your showroom consultation, you will have the opportunity to see what we have to offer through our product and showroom displays. budget of their proposed project. design proposal for the project. visual insight of the site. professional to select materials for the project. and an itemized cost proposal. Mike and Cindy Fitzgerald, owners of Creative Interiors, have been making dreams become realities for more than 30 years. Mike’s experience in construction is vast from new residential and commercial interiors, to home remodels. Extraordinary listening skills and careful planning are keys to making your dream project become a reality. Creative Interiors clients can be confident their ideas will be transformed into the home or commercial project they envisioned. Mike truly enjoys the entire process and can visualize the project from the beginning to the end. Laurel is Creative Interiors’ Designer. She graduated from the University of Nebraska at Kearney with a degree in Interior Design and a minor in Marketing and Management. She is an invaluable member of the team. She brings new and creative ideas to each job. Kami is the Design Center Coordinator. She has a vivacious personality and a strong sense of style. Kami is in the design center to greet and assist customers with selections and any questions that arise. 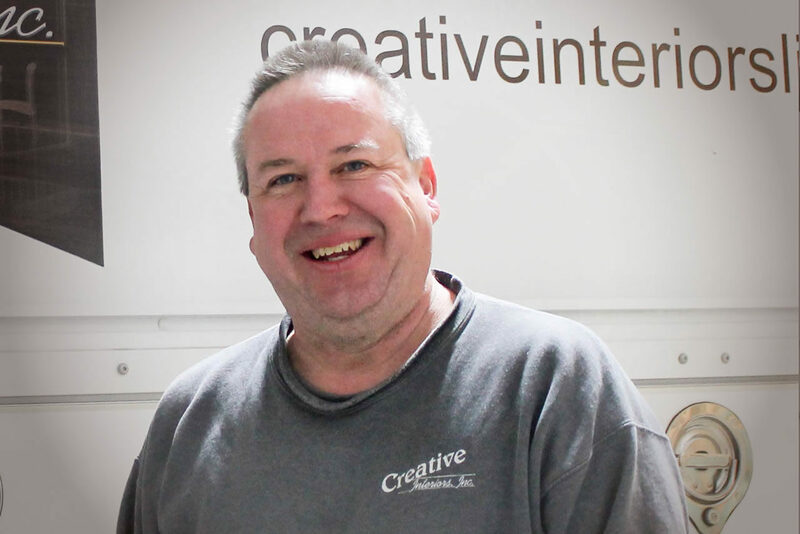 Jill, the Marketing Coordinator, adds fun to the atmosphere and the family-like environment at Creative Interiors. Our team of certified installers has over 35 years of combined experience. Brian leads this team and has been in the construction business for over 25 years. He is extremely detailed in his work and has completed countless projects with many satisfied customers. The Creative Interiors team welcomes you to stop in and visit about your ideas and how Creative Interiors can exceed your expectations. Modern showroom with six distinctively different cabinet displays staffed by trained design representatives to assist you. Prompt and professional service provided by our knowledgeable staff. Full-time Kitchen & Bath Designer on staff to aid in the design of your dream kitchen or bath. A project manager will be present at your job site to make sure your shipment is complete and includes floor plans for quick, easy installation. Every company we represent adheres to strict quality standards and backs their products with manufacturer’s warranty. We are very happy with the quality of our all wood cabinets and kitchen. The Creative Interiors team is highly qualified and professional and finished our kitchen with attention to each final detail. “About three years ago we needed to remodel two of our bathrooms. The best choice for that in North Platte, Nebraska was, and still is, Creative Interiors. In doing that project they definitely lived up to their good reputation. Therefore, when it was time to redo our kitchen/laundry room, Creative Interiors was again our automatic choice. As a result, the design was beyond what we thought was possible, the workers were here everyday, attention to detail was a priority, and everyone listened to our ideas. We are so happy with our new kitchen. It is true to our mid-century home, beautiful, spacious, and efficient. All of that was made possible by the team at Creative Interiors.